At Australia Wide Safari we pride ourselves on field preparation and final presentation of our hunters hard earned trophies. As important as it is to successfully hunt a great trophy animal, the next most important step is to ensure the trophy arrives in good condition to the hunters door step or taxidermist. We will prepare all skulls and skins ready for the taxidermist to begin the mounting work. 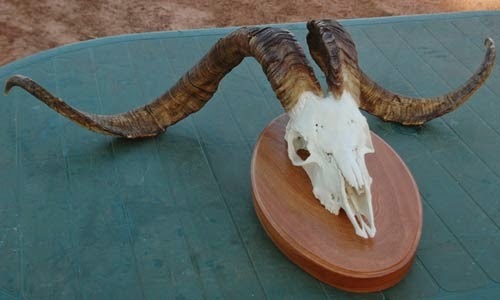 If hunters would like trophy’s finished as skull mounts we can professionally finish these for you. Australia has some beautiful types of wood with which we can make the shields and plaques to mount the skull or tusks. The skulls and mounts are finished to a very high standard and once they reach the hunters home, they are ready for display in the trophy room. All trophy’s are then wrapped, sealed and packaged at Carmor Plains ready for shipment. Our skinning and trophy preparation facility is a 120 square metre building that is a sealed cool room at a constant dry 20C (68F). This allows us to conduct our safaris and the required trophy preparation regardless of the outside weather conditions. The best exclusive safaris on private lands! Australia Wide Safaris own and manage Carmor Plains Wildlife Reserve. The 100,000 acre privately owned game reserve is a pristine area for native flora and fauna and game animals.